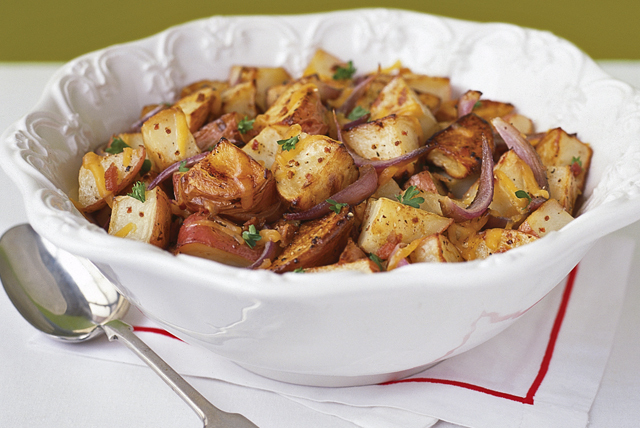 Liven up the breakfast table in under an hour with our Zesty Home Fries Recipe. You'll be amazed at how easy it is to prep our Zesty Home Fries Recipe. Toss potatoes with dressing and pepper in 15x10x1-inch pan sprayed with cooking spray. Spread into single layer. Bake 40 min. or until vegetables are tender, stirring in onions after 20 min. Sprinkle with parsley and bacon; stir. Top with cheese. Bake 2 min. or until cheese is melted. Substitute a mixture of chopped fresh herbs, such as rosemary, chives, thyme and basil, for the parsley.